Despite the nearly 100% traceability achieved in hogs via ADT (which is NAIS done a little differently, or the National Animal Identification System after name change) the hog industry is STILL experiencing a massive disease problem. The entire sell behind NAIS was that traceability would stop disease. Ha! We all know that tags or chips can’t stop disease, and this PED epidemic shows that solidly. However, there are some pretty serious issues brought to light by the PED epidemic. First of all, it should be obvious to anyone that the forced cannibalism that is largely responsible for Mad Cow (BSE) is a bad idea for all species. Secondly, the consolidation in agriculture, especially hogs and chickens, is a serious concern. The fewer producers of food, the easier it is to run into natural or created shortages. Scientists and regulators investigating the mysterious spread of a deadly virus plaguing the U.S. pork industry are stepping up their scrutiny of what the nation’s hog herd eats. With a dearth of solid leads, investigators are exploring whether something in pig feed could be a conduit for porcine epidemic diarrhea virus, which has spread to 27 states and killed millions of young pigs since it was first identified in the U.S. last April. One focus of the inquiry: porcine plasma, a widely used feed ingredient made from the blood of slaughtered hogs and fed to piglets. Scientists say the virus, one of the most devastating diseases to afflict U.S. livestock in years, is fatal only to young pigs, and poses no threat to human health or food safety. 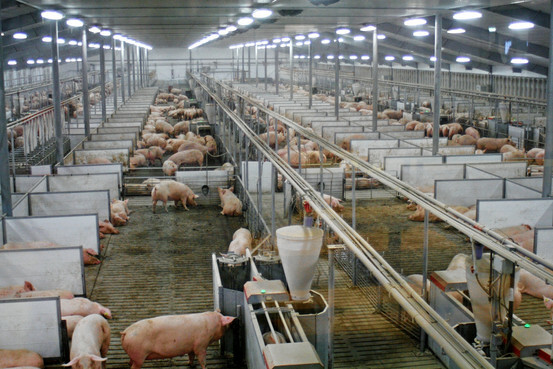 But it has rapidly increased costs for major hog-farm operators, such as Smithfield Foods Inc. and Maschoffs LLC, as prices for replacement pigs have soared to new highs. The disease threatens to curb U.S. pork supplies in coming months and raise costs for big meat processors, such as Hormel Foods Corp. and Hillshire Brands Co. , as well as retailers and consumers, analysts say. The number of new confirmed cases of the virus has accelerated recently, confounding farmers and veterinarians, who have ramped up their already stringent “biosecurity” measures since last spring. Those precautions include more aggressively disinfecting trucks and workers’ boots and clothing when they enter and leave farms and barns. The U.S. Food and Drug Administration, the Agriculture Department and pork-industry officials are examining a range of feed ingredients and manufacturing processes as well as other possible pathways for the virus, like contaminated air or dust particles carried from farm to farm. Though the evidence is inconclusive, some researchers say that porcine plasma could be spreading the virus from adult pigs that show few symptoms, or that some plasma may have been contaminated in transit. The ingredient has been a mainstay of piglet diets in the U.S. since the 1990s, after scientists discovered it provided antibodies to protect young pigs from disease and helped them switch from feeding from their mother to the grain-heavy diet common on livestock farms. Last month, the Canadian Food Inspection Agency disclosed that it had found plasma contaminated with the virus, after multiple hog farms in Ontario that were hit by PED, and another farm on Prince Edward Island with a suspected case, all reported that they bought feed from the same vendor, Ontario-based Grand Valley Fortifiers. 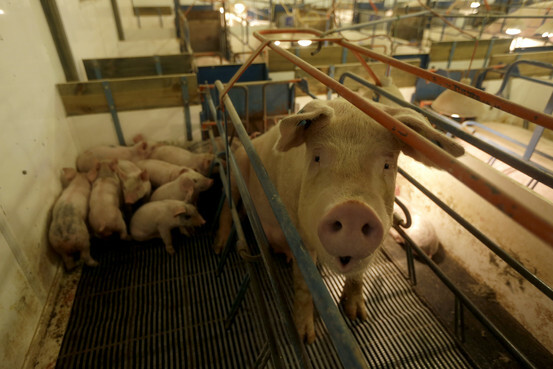 Earlier this month, however, the agency said laboratory tests in which it fed Grand Valley’s feed pellets to piglets failed to demonstrate that the feed, which contained plasma and many other ingredients, could cause infection. The U.S. Agriculture Department and the FDA, which have been investigating potential pathways for the virus’s spread, said they haven’t been able to link feed samples to a known case of the disease. The FDA has been studying the manufacturing process at the U.S. facility that supplied plasma for the Grand Valley feed, and is seeking “to learn more” about the conditions the raw material is subjected to, said agency spokeswoman Siobhan DeLancey. Scientists say studying animal feed is difficult because feed manufacturers mix and process their feed differently. Suspicions already have roiled the half-dozen companies that manufacture plasma in the U.S. and Canada; some farmers have stopped feeding the ingredient to their pigs, out of caution. Sunterra Farms, of Acme, Alberta, recently stopped feeding plasma to the 300,000 pigs it raises each year in the U.S. and Canada. “There are a lot of people making this decision,” said Ben Woolley, vice president. Smithfield Foods, a unit of China’s WH Group Ltd. and the largest hog farmer and pork processor in the world, declined to comment on plasma. Maschoffs, North America’s largest family-owned pork producer, said that without firmer epidemiological evidence linking plasma to the virus it continues to use the ingredient in piglet diets while working with suppliers to ensure its safety. The North American Spray Dried Blood and Plasma Protein Producers, which represents plasma makers, said porcine blood products that are properly sourced, collected and processed are safe and don’t contribute to the spread of the virus. Louis Russell, the group’s chairman, said that feed ingredients like plasma could be contaminated after processing, during transportation or mixing. Porcine plasma is made from blood captured in chilled vats at slaughterhouses. It is treated with an anticoagulant and spun in a centrifuge to separate the plasma from blood cells, then transported in insulated trucks to processing plants. The plasma is shot through a spray nozzle into a heated chamber to evaporate excess water, leaving a powder that is run through stainless-steel dryers, bagged and shipped to feed companies. Plasma makers say they collect blood only from healthy animals in federally inspected slaughter plants. But because the virus has only a mild effect on fully grown hogs, infected animals might not be identified at slaughter, said Liz Wagstrom, chief veterinarian for the National Pork Producers Council, a trade group.